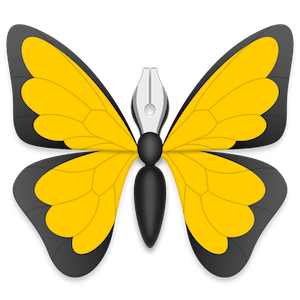 One of my first posts on this site was in praise of Ulysses, the very stylish and capable writers’ text editor I used to write my 50,000-word novella during last fall’s NaNoWriMo. I continue to admire and enjoy this software but I’m about to stop using it. The reason? Ulysses is switching to a subscription-only model. I oppose such a model on philosophical grounds, which I’ll try to outline below. I also think this switch will prove to be a failing business model for Ulysses, unless there are more dilettante/hobbyist writers out there than anyone previously realized. In fact I hope this model does fail, and Ulysses returns to the standard software practice of buy once, then pay for occasional significant updates. Ulysses is moving in the wrong direction. Icon © Ulysses GmbH & Co.
Adobe was the conspicuous pioneer in subscription software and the model has apparently worked for them. The big difference here, though, is that Adobe is the industry standard for designers everywhere. (Since I’m not a designer, I promptly stopped using Photoshop and other Adobe products and was able to replace the functionality I needed with no difficulty.) The equivalent standard for writers, at least where submission for publication is concerned, is Microsoft Word. And Word still offers the ability to purchase the software, instead of subscribing to it. There is no standard software for the process of writing. If there were to be such software, Scrivener would probably be the most likely candidate. Ulysses actually suits the way I write better than Scrivener does, but so do many of its rivals, some of which also offer cross-platform capability (Ulysses is Apple only). And Scrivener itself can be a marvelous writing tool when pared down to its composition mode. The program is not as “pretty” as Ulysses but it does far more. Scrivener is essential for its excellent templates and for its comprehensive export capabilities. You can use it to write fluidly, reorganize and revise in fine detail, and then prepare a flawless manuscript for submission. No other software, including Ulysses, can do all of that nearly so well. iA Writer, Sublime Text (properly configured) and the up-and-coming Write! all provide attractive, customizable writing environments with a left-hand sidebar for project navigation and organization (Write! just recently introduced a local sidebar and is already working to improve it). Update, 4/9/18: I no longer use Write! software and can’t recommend it. See this article for more information. Any of these programs can substitute for Ulysses during the first draft process, with Scrivener coming into play after the first draft is complete. (The software I’m using to write this post, Byword, would also qualify if it would just add a navigational sidebar.) What’s more, all of these programs employ traditional files and folders to organize your work. Ulysses, in contrast, hides your work deep in a largely inaccessible database, though you can deliberately create external files and folders if you wish. Some people think this system provides advantages; I don’t. The cost for the end user becomes disproportionate. Let’s say you paid $45 to purchase Ulysses. Suddenly, you’re asked to pay $40 per year to continue using it. (Granted, existing users pay “only” $30 per year.) Now, this isn’t cost-prohibitive per se. Ulysses is excellent software and many people would argue it’s worth the added cost. But suppose you also buy Scrivener for $45 and then pay for two upgrades at $30 each over a 10-year period. That’s $105 over 10 years for what is arguably the one truly indispensable writers’ program, vs $300-$400 for Ulysses. Ulysses is not worth that cost differential; I think its developers are being a bit greedy here. Suppose every bit of software you use regularly suddenly demanded that you subscribe in order to continue using it. Apart from the significant added cost, it would drive you crazy to keep track of all the required payments. The historical purchase-once, pay-to-upgrade model for software makes far more sense. Ulysses is writing software. Its developers argue they need the extra subscription money in order to deliver “continuous improvements”. Writing software does not need continuous improvements—indeed, constant change for the sake of some supposed “improvement” would actually be detrimental. Once a writing program offers a flexible and pleasing interface, basic editing features and word count and the ability to navigate and modify project file structures, anything beyond is extraneous at best. I don’t use many of the extra features Ulysses already offers. So, unless or until Ulysses comes to its senses, I’ll be using iA Writer and Sublime Text, among other programs, for short fiction and poetry and Scrivener for long-form work and revisions.